I am back, well that is if you have noticed that I was off the radar for a few months now. That is with reasons–we are expanding our family with a second child on the way. We literally expanded our space–when we moved to our new home. In this context I cannot avoid but mention the expansion of my belly at the rate of this universe, almost rivaling the Hubble’s Constant. This pregnancy was a tiresome one, with the added bonus of endless search for ‘the house’ and packing and moving and setting up the house to make it a home, which, is still a work in progress. And of course all this meant that I scaled back on experimenting in the kitchen quite a bit and relied mostly on everyday fare that my husband made or restaurant take outs. But once I was over the initial pregnancy blues, I was back in my element to pig out on whatever I craved….until I was diagnosed with Gestational Diabetes. Never imagined the changes I had to make to my diet (while being pregnant) to manage my blood sugar. Well it would not just suffice to say that I had to give up white rice and find other creative ways and substitutes to get enough calories with lower carb intake. More…much more on that later. In this situation, one of the staples I would always fall back on for making a special dinner or for entertaining is Kadai Paneer, which literally means paneer (Indian Cheese) stir fried in a wok. It is one of the simplest delicacies of Indian recipes, which often is thought as laborious process or requiring too many ingredients. Well, this one debunks all those misconceptions. There is no page long list of ingredients, or ingredients that you can only find in the jungles of Malabar coast. And for sure it does not take all day to make. 25-30 minutes tops! Now a word about paneer. I did not yet dare make paneer at home..so I buy it from Indian grocery store. It is usually sold as a block of 400 grams. Fried paneer is preferred when preparing stir fries or thick gravies such as this, as fried paneer holds up better during stirring. As an alternative to frying it can be baked with same or better results. Be careful not to over bake as it can make paneer chewy. You can also buy fried Paneer, but I find it usually stale after sitting on the shelf for, I don’t know how long. Unfortunately, many Indian grocery stores I see in the States don’t put a date on most of their products–so I always err on the side of caution…and flavor! Arrange the cubed paneer on a non-stick tray ( I lined it with non-stick Reynolds Aluminum foil..with impeccable results) and bake in 400 degree F oven for 5 minutes, just until the edges are starting to brown. This step is optional as you see above in the note. If not baking or frying, just be extra careful when stirring after Paneer is added. Heat 1 tsp oil in a pan. Cube 1 onion and pan-roast until lightly browned. Add the tomato paste and cashews and roast for another 2 minutes. Blend the onion and tomato paste along with cashew nuts into a paste. You may want to add a tablespoon or two of water to the pan to collect any tomato paste stuck to it. This will help in blending as well. In the meantime, chop the peppers into 1-1 1/2 inch strips. Thinly slice the remaining onion. Now add all the peppers and cook on medium flame for 5-6 minutes or until just soft. Add the onion-tomato-cashew paste and mix well to combine with the veggies and cook for another 4-5 minutes. You will see the oil from the cashews separating out. If preferred, add 1-2 tbsps of water to thin out the gravy. At this point add the garam masala. Taste and adjust seasonings as required. Garnish with cilantro and julienned ginger and serve hot with naans, rotis or jeera rice. 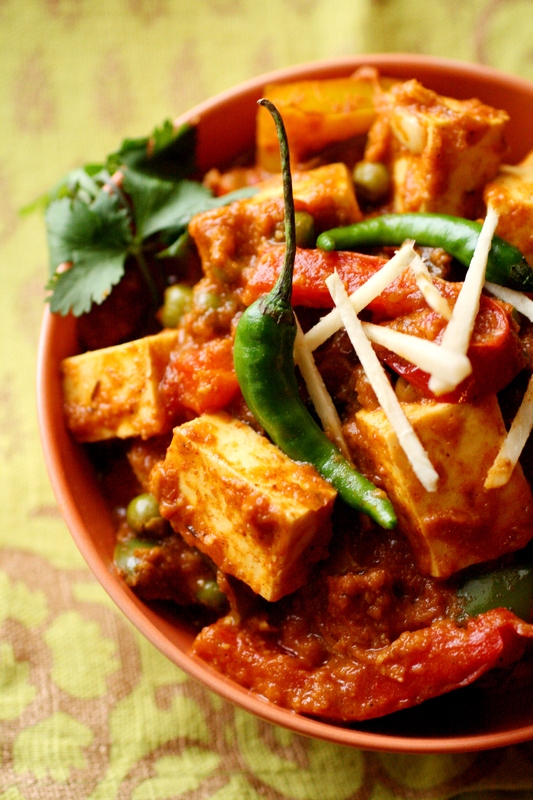 Paneer can be omitted, to make Kadai Vegetables, which is vegan. You may also add other vegetables such as cauliflower, carrots cut into sticks, french cut beans or potatoes and broccoli (although the last two are unconventional) to amp up the veggie quotient. This entry was posted in Recipes, Vegetarian and tagged Indian, Paneer, Vegetarian. Bookmark the permalink. Very nice. 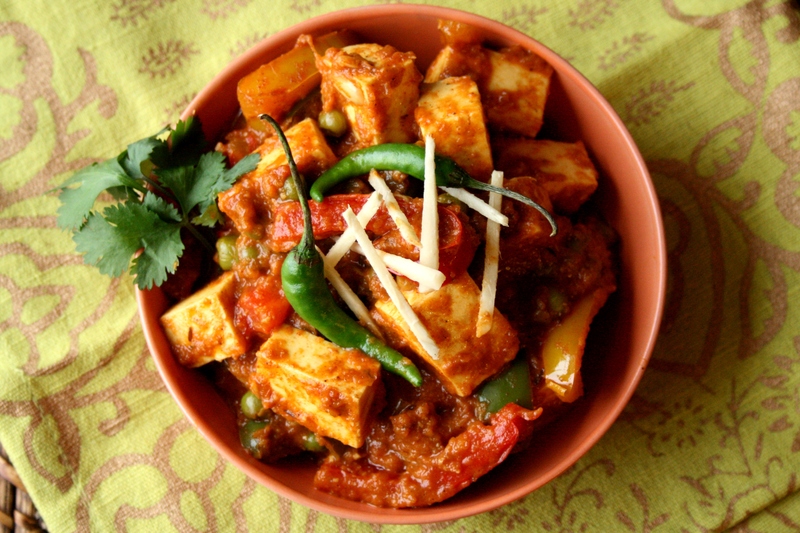 We love paneer and I can smell the spices in the recipe. OK. Now, I’m hungry. 🙂 Good thing dinner is rapidly approaching. So nice to see you back, and such exciting news. I see you haven’t forgotten how to take beautiful photos in your time away. Happy 2013! Hi thanks for such a delicious recipe. I tried once and now this is one of my favorite.